Ford Mustangs originally sold in the United States that were equipped with a 428 CJ or SCJ engine were also equipped with an air injection, or "smog" system to reduce unburned hydrocarbon emissions. Ford called this particular exhaust emission system "Thermactor"; some other FE engines (such as the 390-2v) used the "IMCO" (Improved Combustion) exhaust emission system. The IMCO system uses thermostatically controlled, heated-air induction systems, dual diaphragm vacuum advance distributors, anti-dieseling throttle-stop solenoids, a distributer modulation system, a transmission-regulated spark system, and a spark Delay system. The Thermactor system uses a belt-driven pump to force air into each exhaust port behind the exhaust valve to help burn excess unburned hydrocarbons before they reach the atmosphere. Smog systems did nothing to improve performance. Many buyers of high performance Mustangs chucked the systems as soon as they could to gain a few horsepower by eliminating the pump, to gain some clearance on the sides of the engine, or to eliminate parts that often rusted out fairly quickly because of poor factory paint coverage and high heat. Needless to say, that means that it's hard to find original smog system parts in good condition. Even reproduction parts are expensive. A complete smog system built using a combination of reproduction and NOS parts can easily top $1,000. Here's a table of smog system part names, service parts numbers, and engineering numbers that I'm aware of. Pulley information can be found on the accessory pulley ID page. Nut and Ferrule Assembly C6AZ-9B471-A ? 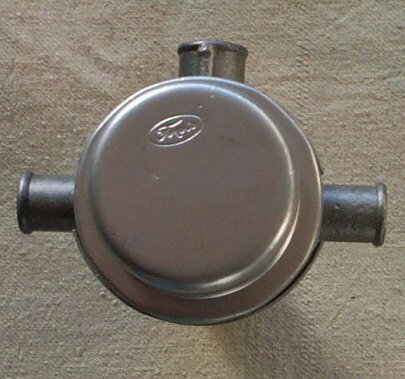 The same smog pump was used on several different cars, so they're not unique to the 428 CJ/SCJ. They're still available from many vendors, and you can usually find a rebuilt pump at your local auto parts store, too. 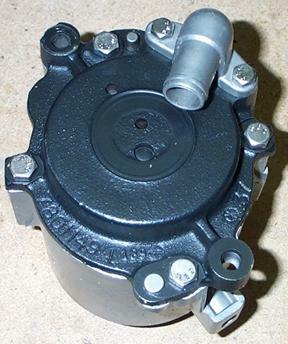 The pump can be made non-functional for show purposes by removing the internal vanes used to pump air. 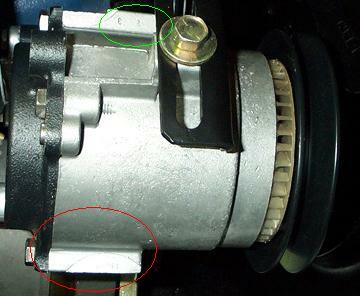 This particular pump doesn't appear to have an engineering number stamped onto or cast into it, but it does have a series of numbers cast into the rear housing and it does have a date code of "9M041" (December 4, 1969, 1st shift) lightly stamped onto the housing (image below, area circled in red). The housing is also stamped "1 2 3" as noted in the image below, area circled in green. The smog tubes/manifolds shown in the picture below are concours-correct reproductions. The larger of the two tubes is used on the driver's side. The bracket mounts to the intake manifold under the coil bracket. 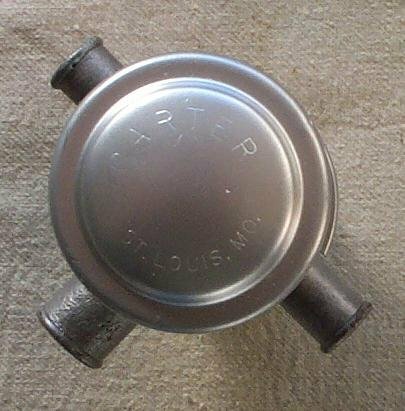 The check valves are NOS Ford; a "FOMOCO" logo is stamped on top of the valve. 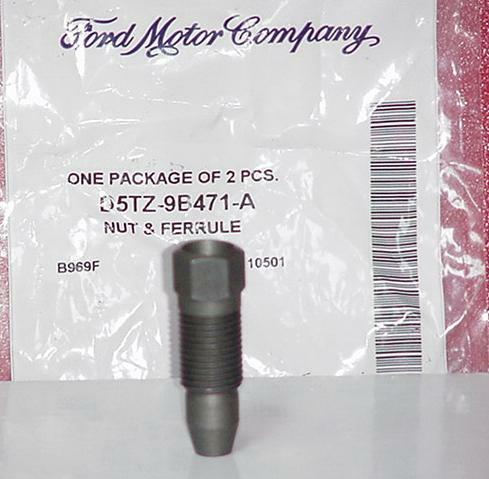 The nut and ferrule assemblies are NOS Ford. 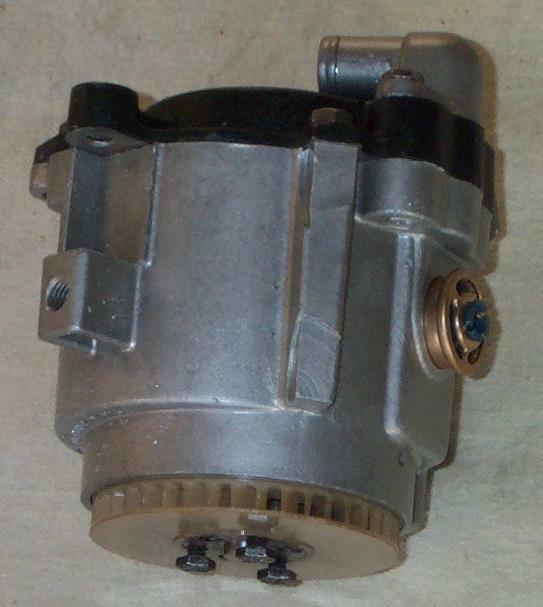 As of the time of this writing they're still available from Ford under part number D5TZ-9B471-A. Note that the nut and ferrule assembly is made of two pieces, with the ferrule being a compression fitting used to secure the smog tubes to a series of ports on the cylinder head. Thanks to Jack Wofford for the picture of the current replacement nut and ferrule assembly. I found that the nut/ferrule assemblies were too tight when I first tried to install them on the repro smog tubes. A few minutes with a rat tail file cleaned things up enough for use. Note that the smog tubes must reach far enough through the nut to be secured by the ferrule when installed. If you can pull out the smog tube after tightening things down you didn't have the tube in far enough, or maybe the ferrule is damaged. These tubes were originally installed on the engine prior to painting. Paint coverage under the tubes was originally pretty spotty. Overspray on the nuts is common and expected. Having the tubes on the engine makes things a little tighter during engine installation, but it is a lot easier than trying to install the tubes once the engine is sitting in the engine bay. If you go the "post engine installation" route you'll find it helpful to remove the engine bay supports and valve covers before trying to install the tubes. A 1/2" wrench is needed to install the nuts. Expect the wrench to scratch the paint on your tubes due to the lack of clearance. The anti-backfire or diverter valve is used to direct air from the pump to the two tubes/manifolds. The valve is marked with a casting number of C8OE-9B289-C, "4491S", and a date code. The date on this one is "4 18 69", which translates to April 18, 1969. There's also a vacuum port on the back of the valve that gets connected to a port in the intake manifold. On cars equipped with ram air the vacuum fitting on the front of the intake is used. On cars without ram air the fitting at the rear of the manifold is used. The top of the diverter valve is marked with a script "Fomoco" logo. The bottom is marked "CARTER" and "ST. LOUIS. MO.". Three hoses are used to hook things together. An S-shaped hose stamped "C8AE-9F287-A" connects the pump to the diverter valve. 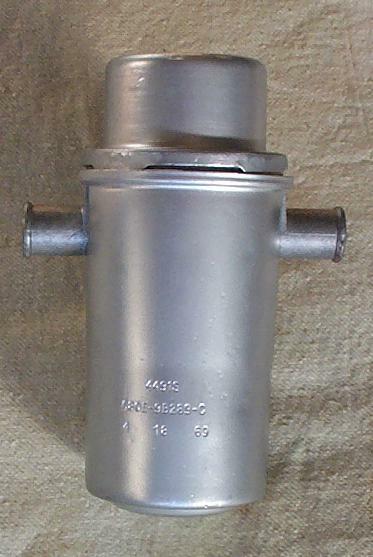 A short hose stamped "C9OE-9B466-A" connects the left side check valve to the diverter valve. The long hose stamped "C8OE-9B466-F" connects the right side check valve to the diverter valve. Each hose is secured at each end with a clamp marked "WITTEK MFG. CO.". I'm a little unsure of the correct stamping on the short hose. The 1969 Osborn Assembly Manual identifies this hose with an engineering number of C9OE-9B466-A; I've recently seen an original hose with a partially-visible stamping of "9B466-A" that seems to confirm this number. 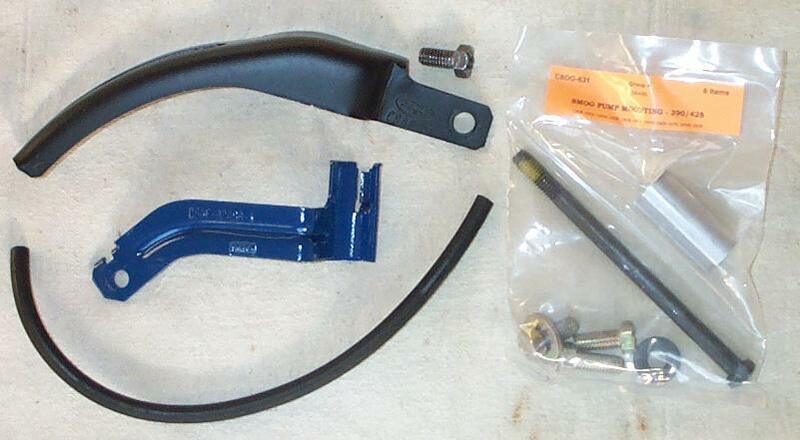 The Ford Master Parts Catalog notes that the service part (using the same part number) was improvised, "cut from C8OZ-9B466-C", which means that a hose sold as a service part would be marked "C8OE-9B466-C". A repro hose I recently purchased (shown in the picture below) is marked C9OE-9C433-B, but I haven't found any documentation to confirm that number. Two* brackets are used to hold things together. 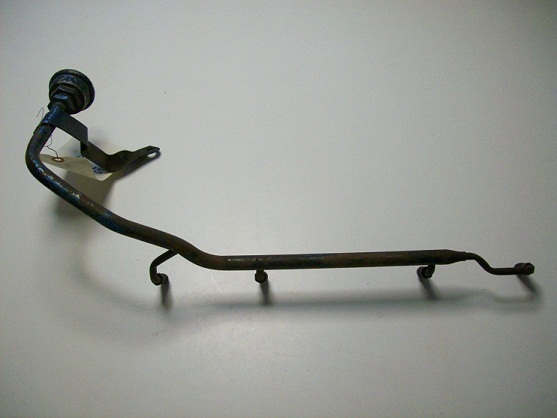 The large black bracket shown in the picture below is used to adjust the position of the smog pump. It's marked "C8AE-B" with a script "Fomoco" logo near the base. The smaller blue bracket is used to mount the diverter valve. It's marked "C8AE-9C486-A". The mounting hardware shown in the picture is available from AMK Products. The hose in the picture is the vacuum hose that connects the diverter valve to the intake manifold. * There's actually a third bracket involved. One of the brackets used to mount the alternator (not shown in the picture) is also used to mount the smog pump.